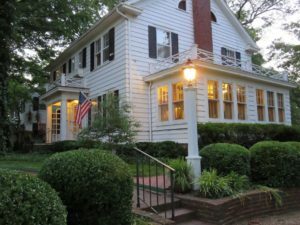 A relaxing Illinois escape awaits you at a Centralia bed and breakfast! Located in western Illinois, just an hour east of Saint Louis, Centralia came into existence in 1853 due to its position at the junction of two major Illinois Central Railroad lines. What was once a noted coal-mining and oil town, Centralia has since emerged as a unique cultural center. Come see what we have to offer! Our area B&Bs offer what Centralia, Illinois hotels cannot. Our innkeepers are proud to welcome you with open doors, comfortable rooms, and great food! Area innkeepers will also be glad to let you in on must-see destinations in and around town. At Centralia’s inns, you will feel like much more than a guest, you’ll feel like one of the family. Upon venturing out from your Centralia, IL lodging accommodations, be sure to enjoy our local offerings. Lake Centralia and Raccoon Lake (also known as the Centralia Reservoir) offer 400 and 700 acres of water for sport and enjoyment. Lake Centralia is surrounded by 580 acres of prairie and woodland, offering ample activities for lovers of the outdoors. If you visit in August, your stay might coincide with Centralia’s annual Balloon Fest. This local gathering of food, entertainment, crafts, fireworks, and more than 40 hot air balloons is held during the third full weekend of August in Foundation Park. Be sure to join us for a great time! Make sure to stop by the Centralia Carillion for the bell concert, given three times a week. Stop by on Wednesdays or Fridays at noon or Sundays at 2:00 p.m. to hear the soaring music. Towering 165 feet over the town, the Carillion is the sixth highest bell tower in the world and is a sight and sound to behold! Of course, Centralia is still a railroad town! Railroad enthusiasts will enjoy the frequent visits of Amtrak and freight trains each day. Fairview Park is home to the 2500 Engine, a steam engine once used by the Illinois Central Railroad. The 2500 Engine can be viewed anytime, and tours of the engine can be arranged. Centralia member inns of the Illinois Bed and Breakfast Association invite you to discover our historic town. We look forward to your visit!